Pseudobonds are drawn to signify connections other than standard covalent bonds between atoms, such as distance monitors, hydrogen bonds, or NMR distance constraints. Pseudobonds are grouped into sets with names such as "hydrogen bonds," and such sets (pseudobond groups) can be treated collectively. A group may contain only one pseudobond, many pseudobonds, or in some cases, zero pseudobonds. Pseudobonds can be created arbitrarily (that is, can be drawn between any pairs of atoms) using PseudoBond Reader. The PseudoBond Panel lists the current pseudobond groups and conveniently enables many operations upon them. There are several ways to start the PseudoBond Panel, a tool in the General Controls category. 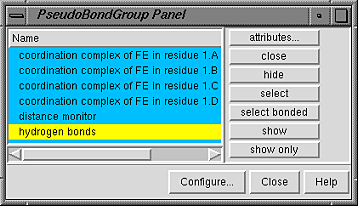 Once one or more groups of pseudobonds have been chosen within the left side of the PseudoBond Panel, any of several functions represented by buttons on the right side of the panel can be executed. Individual pseudobond groups or blocks of groups can be chosen (highlighted) with the left mouse button. Ctrl-click adds to an existing choice rather than replacing it. To highlight a block of pseudobond groups without having to hold down the mouse button, click on the first (or last) and then Shift-click on the last (or first) in the desired block. Configure... allows customization of which settings are shown as checkboxes on the left side of the panel, which buttons are included in the right side of the panel, and what functions are applied to double-clicked pseudobond groups. Close dismisses the PseudoBond Panel. Help brings up the PseudoBond Panel manual page in a browser window. The Configure... button brings up another panel with three sections for customizing the PseudoBond Panel. The three sections are organized like index cards with their names on tabs across the top: Buttons, Columns, and Double Click. Clicking on a tab brings the corresponding card to the front. The Buttons section shows all the functions that can be listed on the right side of the PseudoBond Panel. If a checkbox is activated, the adjacent function will be included in the list. The Double Click section controls which functions will be executed upon a pseudobond group when the group is double-clicked in the left side of the PseudoBond Panel. The default is attributes...; however, there can be zero or many functions in the list for execution. Clicking an entry in the Function menu on the right causes it to appear in the Execution list on the left. Clicking a command in the Execution list removes it from that list. The functions will be executed in the order listed.